Department of Geology, Miami University, Oxford, OH 45056, U.S.A.
Division of Geological and Planetary Sciences, California Institute of Technology, Pasadena, California 91125-2500, U.S.A. The crystal structure of a pale blue transparent Mn-rich fluorapatite (MnO: 9.79 wt%) with the optimized formula ~ (Ca8.56Mn2+1.41Fe2+0.01)P6O24F2.00 with space group P63/m, a = 9.3429(3), c = 6.8110(2) Å, Z = 2 has been refined to R = 2.05% for 609 unique reflections (Mo Ka). The Mn in the Eibenstein an der Thaya apatite is strongly ordered into the four Ca1 sites (82% of the Mn occupies the Ca1 site), as the sites have the following occupancies: Ca1: Ca0.72(1)Mn0.28, Ca2: Ca0.96(1)Mn0.04. The variation of <Ca1-O1> with the amount of Mn substitution (by including previous structures) displays a monotonic decrease in average cation – oxygen distance with increased Mn (r2 = 1.00). 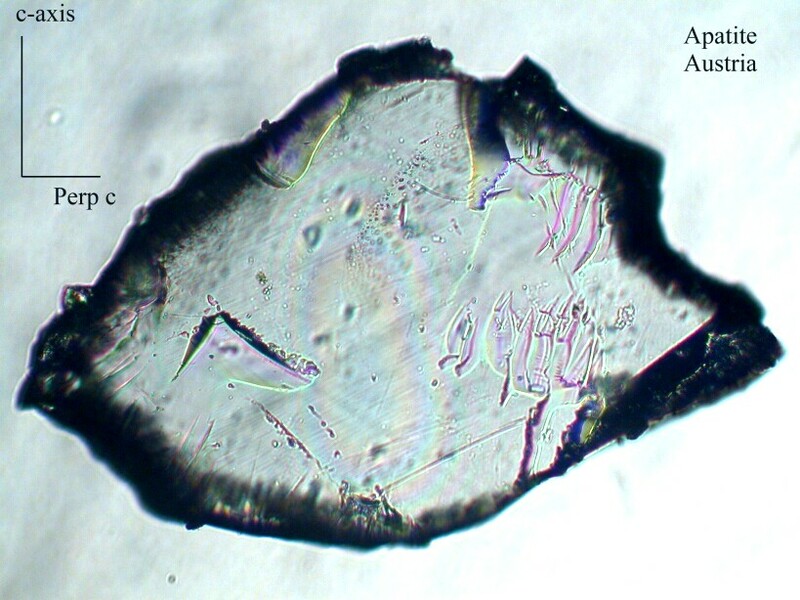 The dominant band in the spectrum of fluorapatite from Eibenstein is in the 640 nm region with E || c > E perp c. The 640 nm band is attributed to Mn(V) at the P site because this band is also seen in spectra of apatite from other localities where the blue color was attributed to Mn(V) at the P site. This interpretation is consistent with studies of well-characterized synthetic materials of the apatite structure that contain Mn(V). Because Mn(V) has intense absorption in the visible region of the spectrum, if a small proportion of the total Mn is Mn(V) at the P site it would dominate the spectrum and the color of the mineral. 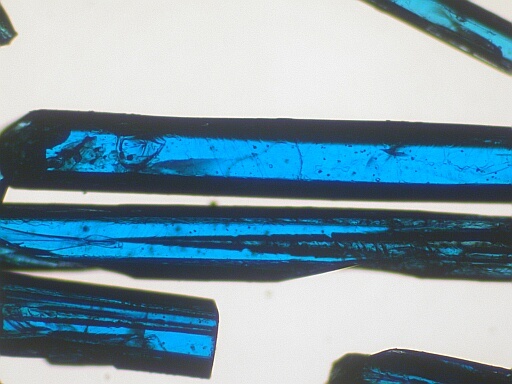 To determine if the pale blue color is a radiation-induced color, a fragment of the fluorapatite crystal was heated at 400° C for 1 hour. The change in color was slight, and the color remained pale blue after heating. All of these observations are consistent with the origin of color from a component of Mn(V). Assuming that all the intensity of the 640 nm (E || c) absorption is from Mn(V), the concentration of Mn(V) in this fluorapatite was calculated to be 2.6% of the total manganese (~ P5.96Mn5+0.04). The calibration was estimated from the spectrum of the related compound Sr5(P0.99Mn5+0.01)3Cl. The weak band at about 404 nm in the E || c spectrum may be the corresponding band for Mn2+ in octahedral coordination.